Fruit War is a multiplayer turn-based, physics-oriented strategy game, in a similar vein as Scorched Earth and Worms. 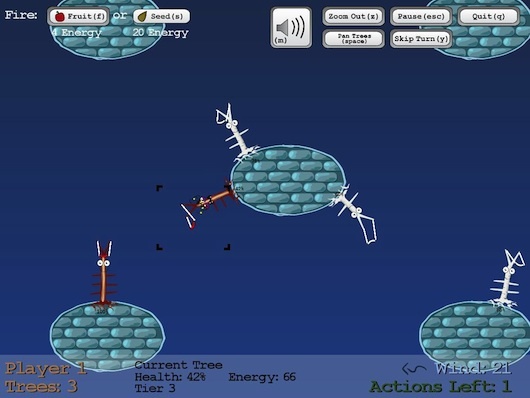 Players take turns planting slingshot trees and firing fruit at their enemies. The first player to destroy all opposing trees wins! Fruit War was built on a simple premise: the slingshot. Just like the toy that you grew up with as a kid, the joy of Fruit War comes from three things: pulling back the elastic and taking aim, watching the shot fly, and, most importantly, watching it smash into your target! In order to capture this essential experience, Fruit War incorporates the Farseer Physics library for XNA, allowing for not only realistic ballistics but also destructible objects: as fruit fly through the air and crash into trees, they will cause branches to break and snap off. The strategic element of Fruit War is controlled through its robust energy system. 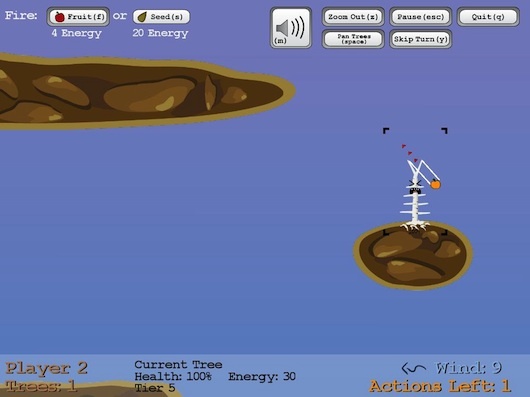 Trees generate energy every turn, which can either be stored or used to fire projectiles. As trees store energy, they will grow larger, resulting in larger health pools and more firing power. However, firing shots will expend this energy, causing the tree to grow more slowly. Managing this energy effectively between offense and defense is one of the major keys to victory. Fruit War also comes with a variety of maps to help keep the gameplay fresh and interesting. 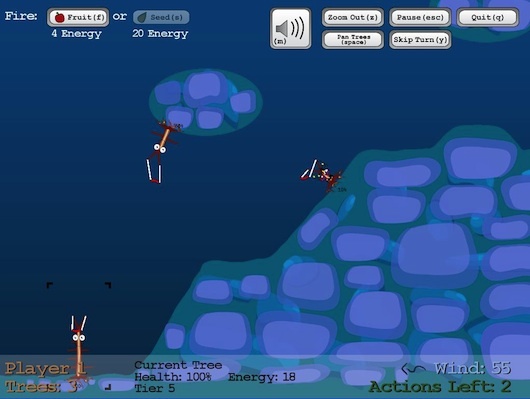 Players can choose between three different levels, all with completely unique geography that require different types of strategies to succeed. Overall, Fruit War has been designed to provide a rich, rewarding strategic experience wrapped around a simple and incredibly fun to use slingshot mechanic. We hope you have as much fun playing it as we did making it! © Copyright 2019 Mark Laframboise. All Rights Reserved.